For the former Chancellor of Germany, see Gerhard Schröder. The son of a railway official, Schröder was born in Saarbrücken, then part of the Prussian Rhine Province. Having passed his Abitur exams, he went on to study law at the University of Königsberg and two semesters abroad at the University of Edinburgh, where he, according his own accounts, became familiar with a British way of life. In 1932 he finished his studies in Bonn in 1932, where he had committed himself to the university group of the national liberal German People's Party. Schröder passed the first and second Staatsexamen in 1932 and 1936. Having obtained his doctorate in 1934 and worked as a consultant at the Kaiser Wilhelm Society in Berlin. Still as a referendary in Bonn, he had joined the Nazi Party on 1 April 1933 and also the SA. He continued his career as a law firm employee and in 1939 obtained an attorney's certificate and worked as a tax lawyer. He left the NSDAP in May 1941 (a rather rare occurrence). In the same month and perhaps in connection, he married his wife, Brigitte Schröder née Landsberg, needing - she was half-Jewish - with an extraordinary permission by his Armed Forces superiors. He held federal office as Minister of the Interior (1953–1961) and as Minister of Foreign Affairs (1961–1966) in the cabinets of Chancellor Konrad Adenauer and of Ludwig Erhard. 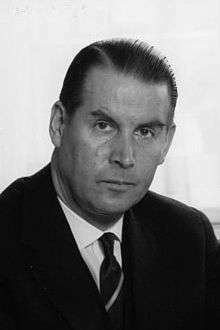 From 1966 to 1969 he served as Minister of Defence under Chancellor Kurt Georg Kiesinger. 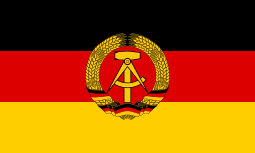 In 1969 Gerhard Schröder ran for the Office of the Federal President (supported by CDU and NPD), but he was beaten by Gustav Heinemann, the nominee of the SPD (supported by FDP), at the third ballot with 49.4% to 48.8% of the votes of the Federal Assembly. ↑ "Reply to a parliamentary question" (pdf) (in German). p. 133. Retrieved 22 December 2012. Wikimedia Commons has media related to Gerhard Schröder (CDU). Martin Menke: Review of Torsten Oppelland, Gerhard Schroeder (1910-1989): Politik zwischen Staat, Partei und Konfession, H-German, H-Net Reviews, March, 2004. Photograph (Gerhard Schröder is the second person from the right).